The Red Devils’ victory came a bit bigger after netting four goals against Crystal Palace. Marouane Fellaini scored twice after Juan Mata opened the scoring in the third minute. Romelu Lukaku bagged one late to doom Palace to a seventh-straight goalless loss. At Stamford Bridge, City made a bigger statement of intent cruising to a 1-0 victory over Chelsea. 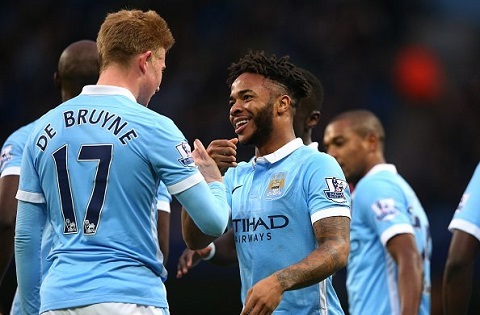 The only goal of the match came from Kevin De Bruyne after a great run moments after the hour mark. His strike proved to be the difference at the end of the day. West Brom and Watford played to a two all draw. Salomon Rondon and Jonny Evans scored to open a 2-0 lead for the hosts. But Abdoulaye Doucoure pulled back one and Brazilian Richarlison added an equalizer for Watford. Harry Kane proved too heavy for Huddersfield when he scored a brace. Moussa Sissoko added another one for Tottenham while Ben Davies rounded up the 4-0 victory for Spurs. Diafra Sakho came off the bench to score for West Ham in crucial 1-0 win over Swansea. Elsewhere Southampton succumbed to a 2-1 away defeat to Stoke City. The hosts got its goals from Mame Diouf and Peter Crouch while the Saints’ goal came from Maya Yoshida.